Dig into these posts to get a solid foundation for the project details, methods, and learnings. We share our work on medium to support transparency, accountability, and to invite our residents to participate in shaping the services they rely on. Austin Resource Recovery partnered with the City’s Design, Technology, & Innovation Fellows program in September to unpack why Austin residents struggle to recycle. 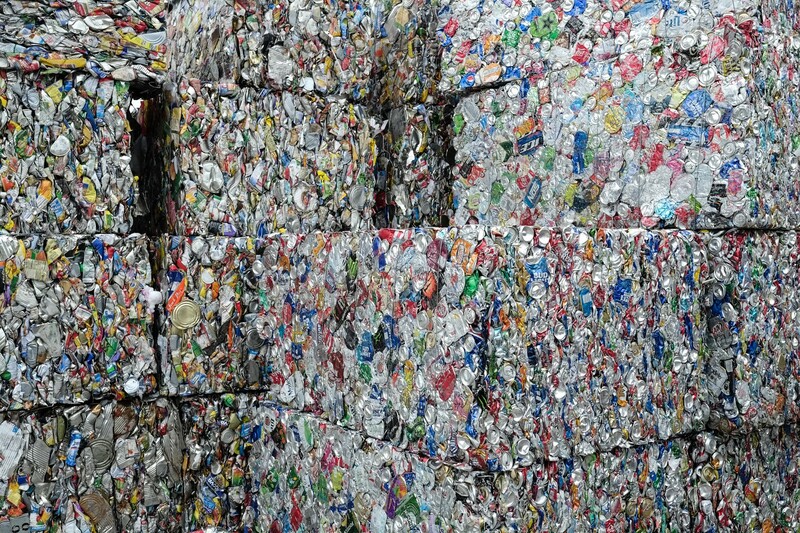 Austin recycling rates have stagnated in recent years, falling short of the city’s ambitious goals to be keeping 90% of disposals out of landfills by 2040. We met residents in their homes and learned that most residents are recycling, even if it’s a small amount. We know now that the challenges each person faces to being able to recycle or recycle well vary based on past experiences with recycling, industry perception, and other previously unidentified roadblocks. Now we’re developing and testing potential solutions for addressing those challenges. Last week, we paused to reflect on our work and choose the best path forward. 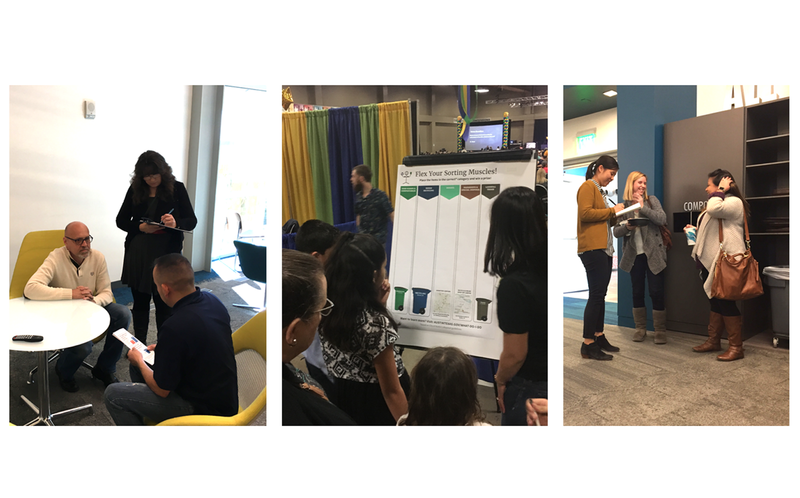 Our team has been working diligently to prototype and test 8 solutions with the greatest potential for impact on residential recycling habits. We developed a framework from our research made up of 3 parts: knowledge, ability, & motivation. Our initial approach was to use design to address all of the opportunity areas within the framework. After 4 weeks of prototyping and 4 prototypes, we realized we needed to narrow our scope. We were trying to tackle too many different opportunities and it was exhausting the team. Content Strategy: use research learnings and behavioral personas to create a reliable, shared vision and tool that Austin Resource Recovery teams and partners can refer to when developing content initiatives. Household Sorting Guide: show residents the how, what, and where of Austin household disposal, giving them the confidence that they’re recycling correctly, and ultimately increase recycling and reduce contamination. Outreach Tool & Kit: gives Austin Resource Recovery staff and Block Leaders the tools to quickly assess which elements of the framework — knowledge, ability, & motivation–a resident needs help with and provide them with relevant information to address those specific needs. With renewed direction we strategized the next several weeks of work to reach our goals. 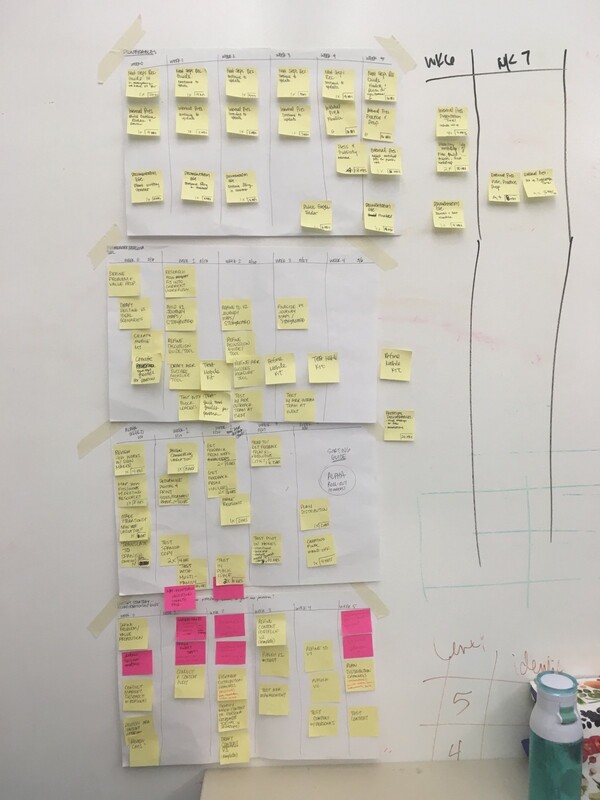 We used stickies and scrap paper to draft the new plan, then reviewed the timelines as a team, and finally created a spreadsheet detailing our work ahead. This is a great way to plan timelines with multiple people before committing to a digital format. Keep everything flexible until you need to commit! Tackling recycling challenges is a big feat. Once you’ve scratched the surface, it’s hard to choose only one or two ways to address residents’ many diverse challenges. Working alongside Austin Resource Recovery partners since the beginning of this project means they know where we are and how to work with us to devise a plan for moving forward. Our team narrowed our scope to creating a shared vision for Austin recycling. 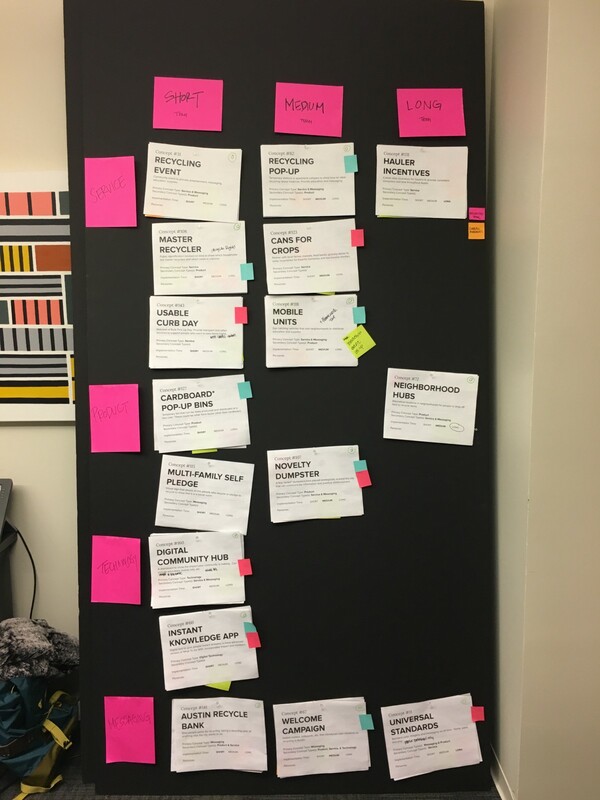 Now we can fully design and test our rough ideas to create reliable tools and messaging for Austin Resource Recovery, partners, and residents to beginning using at the close of this project.